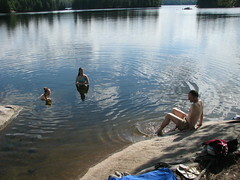 We set off early Saturday morning and arrived at Canoe Lake around noon. We picked up our permit and canoes and ate some lunch before loading up and heading off. Thomas and Shoshanah caught onto to the canoeing pretty quickly and so we made pretty good time. We stopped off at Tom Thomson's Cairn before making our way to the first portage (the one my grandfather likes to call the Highway 401 service centre - it's always packed with people). We made it through the portage pretty quickly and were our way to our first campsite of the weekend on Teepee Lake. We settled in for the rest of the afternoon and enjoyed the beautiful weather, probably the best weather all summer in fact. Thomas gathered up a great pile of firewood and we had some dinner and then sat around enjoying the evening. We were up early the next morning as I had stressed to the group that we'd want to be on the lake early so we would get our choice of campsite. They were game and we were off to the portage from Little Doe to Burnt Island Lake where we'd spend our next night. This would be our longest portage of the trip at roughly 1.4km but it was actually surprisingly easy with the ultralight kevlar canoes we had rented. Meg carried the food barrel and a day pack, Thomas and Shoshanah each had their own packs and shared the canoe and I carried a pack for Meg and I and our canoe. With one trip we were done pretty quickly and onto our last lake of the day. We had hoped to get an island site adjacent to the portage so that we'd be able to get up and be through early on Monday morning on our way out, but even though it wasn't even noon yet there were some people at each site. I would hazard to say that they were probably people who came in on Friday or Saturday and spent the whole weekend at one site, not my idea of a great time, but to each their own. I enjoy the nomadic nature of canoe tripping personally. We found a great site that was on a south western point and stayed in the sun for the whole evening and would have adequate sun Monday morning as well. It was a great site with rocks that had sat in the sun all day and were toasty warm later in the evening. We had a chance to take a nice swim at a nearly sandy beach and enjoyed a great afternoon and evening, culminating with another great fire. The next morning saw us pack up and begin to make our way out. 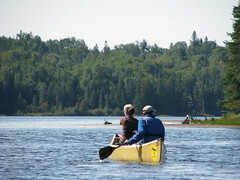 Again, I was impressed with Thomas and Shoshanah's paddling, it improved a great deal over the weekend. We made our way back towards Canoe Lake, passing from Burnt Island through the set of Joe lakes (Baby Joe, Lost Joe, Little Joe and Joe). As we left the portage to Little Joe, before we came upon Arowhon Pines, Meg and I heard a loud crashing noise - thinking it might be a moose we looked around at the shore but couldn't find anything. We paddled on a short bit further and then noticed a brown shape moving on the southern shore. Sure enough it was a moose, in fact there were two - likely a mother and calf. They didn't really show themselves much though and while we were silent they beat a hasty retreat into the bushes. We cruised by Arowhon Pines, a beautiful luxury resort, on our way to lunch and the 401 portage. I think we probably finished our trip around 2:30 which I was really impressed by. We packed up the car, returned the canoes, used the washrooms and were on our way back to Ottawa. I'll be spending the next year and a bit trying to convince Meg that we can do a bit of a longer trip - the last time we went we spent four nights in the interior (after a night at a Hwy 60 corridor campsite on arrival) on a great trip from Smoke Lake. I'm eager to try a trip from Canoe up through Tom Thomson Lake, McIntosh, Big Trout and back through Burnt Island on the way out. It would probably be a 5 night trip though, so we'll have to see when it might be in the cards. Submitted by Jenn (not verified) on Sat, 2009-10-24 20:38. Submitted by Anonymous (not verified) on Sat, 2009-10-24 20:41. Sounds like you had a great time. I will have to make sure Grandpa reads it as he is always thrilled to think that his love of canoeing is passed down..